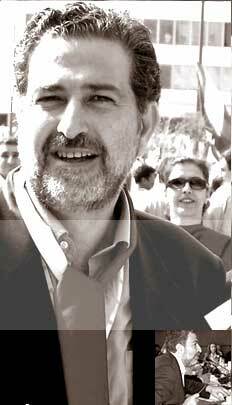 Samir Kassir, R.I.P. Days after the election, a feisty Lebanese journalist is murdered. Why? Journalists dread the moments they have to write the obituary of a person they know, but when it's a colleague and a close friend the effort becomes a penance. This morning, Samir Kassir, whom I interviewed about a year ago for Reason, was killed by a bomb placed in or under his car. Samir was many good things to his many friends, but he was also, undeniably, the media figure who contributed the most to denouncing the hegemony over Lebanon of the Syrian and Lebanese intelligence services. Who killed Samir? Perhaps this comment from a municipal worker at the site of the explosion pointed in a general direction: "The army doesn't forgive its critics." However, it would be more accurate to say that Samir had enemies throughout the security and intelligence apparatus, largely because he was so effectively insolent in denouncing their hold on Lebanese political life. Several years ago, the head of the General Security Directorate, Jamil al-Sayyed, once the most powerful man in Lebanon after the Syrian officer tasked to manage the country, had his men tail and harass Samir for weeks because he had written an article critical of Sayyed. At the time, a number of politicians had asked Samir to ride with them as a means of expressing their solidarity. This included former Prime Minister Rafik Hariri, though, as Samir later told me, the only ones who pulled out guns and threatened to shoot Sayyed's goons were the bodyguards of Druze leader Walid Jumblatt. What was the message in the killing? There were many. It was, first, a settling of scores for past affronts; it was a warning to the opposition (Samir was a leading figure in the Democratic Left movement, one of the parties that had demanded a Syrian pullout from Lebanon); it was also a warning to the press to shut up; and it was an affirmation that no one should envisage profound change in the security services, or contemplate removing the person sitting atop the security edifice, Lebanese President Emile Lahoud. Indeed, both Jumblatt and the son of Rafik Hariri, Saadeddine, have made it clear that among their first priorities after Lebanon's parliamentary elections end in late June will be to remove the president. Hariri in particular believes that the security services, working on behalf of Syria, were deeply involved in the assassination of his father. I first met Samir more than a decade ago in the offices of Al-Nahar, Lebanon's leading daily newspaper. He was young, stylish, arrogant, and sanguine, irresistibly so, and he had the brilliance to pull all that off. He was also someone, I steadily learned, who had the patience to listen. That came with the territory of teaching at St. Joseph's University, where he always had time for students and a willingness to take them seriously. His behavior also confirmed that under that brashness was a hefty reservoir of modesty. In the mid-1990s, Samir was asked to edit a French-language magazine titled L'Orient-Express. It was a monthly supplement to the sleepy French-language newspaper in Beirut, but it retained editorial independence. Almost immediately, the magazine became one of the most stimulating political-cultural publications in town, as Samir became axle to dozens of eager spokes; most of the contributors were not quite sure they could write until they fell into Samir's overpowering mill. He would berate, provoke, and motivate; and I still remember with delight how, with deadlines already past, he would calmly edit a piece, munch on a sandwich, carry on a conversation with three people, and pull on a cigarette. In the end the magazine suffered because of its success. Advertisers saw a profitable product, so they tried to transform it into a society rag. When Samir refused to be pushed around, they withheld advertising as punishment, and the publication slowly died. The quality of the content also set off alarm bells in the offices of the editors of the daily paper, who knew it only highlighted the mediocrity of their own endeavors. They asked their owner to pull the plug on the magazine, and he reluctantly obliged. At around that time I saw Samir driving a flashy new car, a dark blue Audi: It was to infuriate his detractors, he told me with a smirk. Samir will best be remembered for his weekly column in the Friday edition of Al-Nahar. One of the first at the site of his murder was Jubran Tueni, the paper's publisher who was recently elected a parliamentarian from Beirut. He radiated disbelief, though he and Samir had had their political differences. It was Jubran's father, the distinguished Ghassan Tueni, who had hired Samir and who, like him, had a mind in effervescent counterpoint. There was something paternal in the relationship, and it was with pride that Ghassan seemed to survey how gamely Samir chipped away at the cheap masonry of the Syrian order. There was also in Ghassan and Samir a common sympathy for the Arab world and its aspirations and follies--the attention of two Greek Orthodox Christians who regarded their minority's isolation from the surrounding region as absurd. The last article Samir wrote was about a country for which he had a passion, Syria. His enthusiasm was not for the despotism of the Assad regime or the contemptible kleptocracy its has presided over; it was for the Syrian people and the opposition; for those countless men and women thrown into the dungeons of the Baath Party during the past decades--all of them victims of exceedingly stupid men. His column (which Syrians could only read in samizdat, Al-Nahar being denied entry into Syria) lamented the fate of a group of civil society activists from the Jamal Atasi forum, and their imprisonment for having dared allow the reading in their discussion group of a letter sent by the leader of the Syrian Muslim Brotherhood. Amid general outrage, several of those arrested were released earlier this week. Samir surely had a small part in that the minor victory. Nor could Samir quite forgive how the Syrians had once tried to swallow the Palestinian cause, to transform it into a branch of their foreign policy. The lingering thread throughout his work was the Palestinians and the tragedy of their recent history. It was revealing how when Sayyed tightened the screws, he accused Samir of being Palestinian, confiscating his passport to allegedly investigate whether his claims to Lebanese citizenship were valid. It was a profoundly vulgar effort, both for implying that one was somehow tainted by being Palestinian and for ignoring that the Kassirs were originally Beirutis who had emigrated to Palestine, before returning. Throughout Beirut today there is a single regret: that Samir's foes should have gotten him even as the fetid system they spent years setting up slowly collapses. In response to a piece I had published by Samir last year, the newspaper for which I work received a telephone call. "Why are you publishing Samir Kassir?" the person on the line demanded, in lieu of a direct threat. Well, here's the answer: Because Samir Kassir had balls in a country that under Syrian rule spawned cowards and sycophants; he had ideas and openness in a system that rewarded mediocrity and intolerance; and he had the compelling scornfulness for imposed authority that so irritated his murderers--and that we will continue to relish when this cowardly confederacy is kicked into a shallow grave. Reason contributing editor Michael Young is opinion editor at the Daily Star newspaper in Beirut. Gizelle Khoury: "Become active because Samir loved activism"